This job was done by Framing Futures Inc. It was a challenging addition to a smaller home. The addition included 7000 sq. ft. of new space and was contracted by Meihm Designs. This addition was framed in an unique way. Many of the walls were framed on the ground in a separate area and boomed into place. 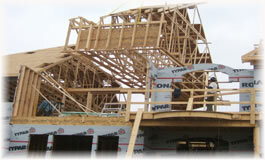 Sections of the roof were completed in the same way and the pieces were craned into place as seen in the third picture. This is a very safe way to build as it limits the amount of work that needs to be completed in high areas. It is also efficient as the work can be completed quicker without the height concern. 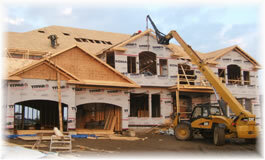 Framing Futures specializes in framing residential homes but is able to complete many other projects. We have done many challenging additions and renovations. They include finishing basements, adding rooms, building garages, gazebos, pool houses and storage spaces.